First told you guys about Harrison Greenbaum’s upcoming (Friday, 2/15 & 2/16- 7:30pm) shows at the Mizner Cultural Center in Boca Raton on 2/5/19. Just checked the box-office miznerparkculturalcenter.com and goldstar.com (discount tickets) and both shows have a small handful of tickets still available. 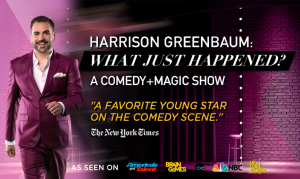 I’m telling you guys- you don’t want to miss Harrison Greenbaum: What Just Happened? A Comedy + Magic Show. 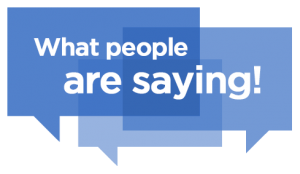 * Harrison Greenbaum: What Just Happened? A Comedy + Magic Show. Don’t miss award-winning magician and comedian, Harrison Greenbaum, who has been featured on ABC’s “America’s Got Talent,” NBC’s “Last Comic Standing,” National Geographic’s “Brain Games,” and more – as he brings us on a gut-busting, jaw-dropping ride through the amazing, hilarious and the unusual! Experience a theatrical magic and comedy extravaganza that deftly combines “smart, witty, and lightning quick punchlines” (SceneTracker) with jaw dropping, cutting-edge illusions, mind reading and legerdemain. This show is a unique blend of Harrison’s award-winning comedy, which he has performed at comedy clubs and festivals around the world, with original magic, much of it invented specifically for this show and never before seen. *Admission is restricted to those age 16 and over. My husband and I just got home after seeing the show.